Item as described and shipped quickly. Thank you! Good deal! Works great! Thanks! Game arrived early, in basically new condition only the game box has been opened, disc was flawless, and game worked perfectly, and at good price. 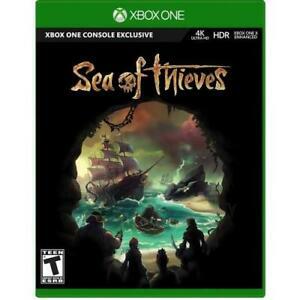 It has the potential to be a very fun cross platform social game of questing and pirating, but instead it too often becomes a game of keep away from PC trollers who will spawn kill you until you give up and scuttle your ship. There is a definite advantage in favor of the controls for PC players over those on console, so defending yourself in battle quickly becomes a one-sided affair. Next, unless you have several friends to join your crew and help to accomplish voyages or taking down enemy ships and fortifications, there's very little achievable content. I originally bought this game to play with some friends, and unfortunately I don't enjoy it enough to wait through the long load screens to even do that. Not a game I would recommend taking a flyer on. I'd try it for free on Gamepass first if you can. great game! fun to play! beautiful graphics! This is a great game! Its growing in functionality everyday! And what's not to love? Swords, flintlocks, and my personal favorite; bananas!! 3 different sized ships to choose from, customize your pirate, MOe alliances and double your bounty!! Give it a try, cause u know you're gonna love it!! Yes, it’s all a bit repetitive, but the challenge grows as your reputation grows. Way more fun with friends, so party up! The graphics of the water, whether calm, peaceful seas or roiling, stormy waves are absolutely stunning.